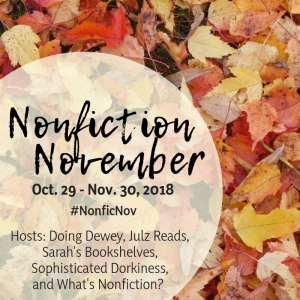 I’m participating for the first time in an event called Nonfiction November. I wish I had known about this sooner as it’s perfect for this blog. Three ways to join in this week! You can either share three or more books on a single topic that you have read and can recommend (be the expert), you can put the call out for good nonfiction on a specific topic that you have been dying to read (ask the expert), or you can create your own list of books on a topic that you’d like to read (become the expert). I’ve been book blogging for 15 years so there are a few topics I’ve read a LOT of books on. But I’m going to share two subjects. Please keep in mind that many of these reviews are VERY OLD and aren’t as detailed and well-written as my reviews are now, although they have been updated. However the books are still awesome. I don’t have a kid with Autism but I’ve always been fascinated with it and like to read about it. There’s a Boy in Here by Judy Barron – written by the parents AND the child with Autism. Thanks for reading and let me know if you’ve read any good books on Pregnancy or Autism.